Bright news: Due to a variety of new technological advances, electrical use in the U.S. has declined for the third straight year.Courtesy RamjarSo often, the headlines are filled with gloom and doom when reporting on energy usage, climate change and such matters. But here's some bright news. U.S. electrical consumption has dropped down to the lowest levels since 2001. And that comes as we're using more electrical devices than ever. Here are the full details. It's the third-straight year U.S. electrical consumption has gone down. Quickly summarizing, there are several factors for this significant drop in power use. Many major appliances have been re-engineered to be more efficient and use less electricity. Homes and buildings are better insulated and designed to keep air conditioning inside in the summer and cold out in the winter. More people are using compact fluorescent bulbs and LED lighting that consume much less electricity than incandescent bulbs. And the trend looks to continue this year with another 1 percent drop in electrical juice consumption. Wind power vs. eagle power: New regulations hope to spur more development of wind farms (above) by removing penalties power companies face if they kill bald eagles (below).Courtesy Jesus MartinezIn an interesting match-up between alternative energy sources and wildlife protection, wind energy appears to have come out the winner. The Obama administration and the Interior Department last week decided it will waive penalties for up to three decades to wind energy farms that kill bald eagles in the generation of electrical power. 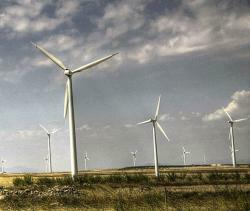 The birds are killed when flying into the path of spinning wind turbine blades. Eagles in flight are especially susceptible to turbine blades as they're attention is often focused on the ground looking for prey rather than looking forward to see obstacles. The new rule will give legal protection for the lifespan of wind farms and other projects if companies obtain permits and make efforts to avoid killing protected birds. If they end up killing more birds than estimated at the start of the project, additional safeguards for the birds would then kick in. Numbers of eagle kills would be reviewed every five years. Wind power companies would have to document eagle deaths caused by their blades, but that information would not be made public. Proponents of the plan say it will free up companies to look into expanding wind farms and providing "cleaner" electrical power. Currently there are no protections against eagle kills, which might be limiting building new wind farms. Just last month a company was prosecuted for eagle killings at two wind farms in Wyoming. 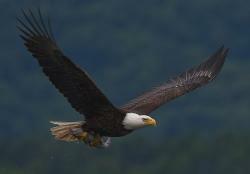 Bald eagles were removed from the endangered species list in 2007 but are still protected under two federal laws. Since 2008, official numbers peg eagle deaths due to wind turbine blades at 67. But that figure does not include eagle kills from the Altamont Pass in California, where a large wind farm is believed to kill about 60 eagles a year. Wind turbines can be massive, reaching up to 30 stories tall. Tips of the turbine blades can be spinning at speeds of 170 miles per hour on extremely windy days. The U.S. Fish and Wildlife Service agrees with the new regulation as it will allow it to more closely monitor the relationship between eagles and wind farms. So what do you think? Is the price for increased "clean" electricity worth the cost of more eagle deaths? Share your thoughts here with other Science Buzz readers. This week Time has an amazing feature showing time lapse satellite images taken from space document land-use changes over 30 or 40 years at significant locations around the world. Watch a lake practically dry up in Asia. See the retreat of the Columbia Glacier in Alaska. View the sprawl of Las Vegas across the Nevada desert. And there's much, much more including an option to select a spot on Earth you especially care about. Cool stuff. Solar plane: The plane Solar Impulse is making a cross-country trek over the USA.Courtesy © Solar Impulse | Revillard | Rezo.chIt's one flight down and four more to go for Solar Impulse, the completely solar airplane that's soaring its way across the USA. 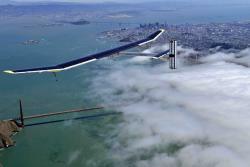 Solar Impulse flew from San Francisco to Phoenix on May 3, taking a shade over 18 hours to complete the trip. Over the next couple months, it will fly legs to Dallas, St. Louis, Washington D.C. and New York City with the New York trip scheduled to conclude in early July. For the stat freaks, the solar plane averaged a speed of 40 miles an hour at an average altitude of 10,000 feet. It soared to a maximum altitude of 21,000 feet over the 650 mile trip. And yes, it took off and landed in the dark. More information about the Solar Impulse project can be found at its website here and to follow its progress flying across the country. So how does a solar airplane work exactly? Made of carbon fiber, the plane has the wingspan of a Boeing 747 (208 feet) and the weight of a small car (3,527 lbs). It is the result of seven years of intense work by a team of about 80 people and 100 partners and advisors. The 12,000 solar cells built into the wing provide four 10 horsepower electric motors with renewable energy. By day the solar cells recharge lithium batteries which allow the plane to fly at night. Swiss pioneers Bertrand Piccard (chairman) and André Borschberg (CEO) are the founders, pilots and the driving forces behind Solar Impulse. The plane made its first night flight in 2010 and has a record endurance flight of 26 hours, 10 minutes, 19 seconds. • The electricity produced by the solar panels is about the same as needed to run a scooter for 24 hours. • The light plane is sensitive to turbulence. Winds cannot exceed 11.5 miles per hour at take off and crosswinds at takeoff can be no more than 4.6 miles per hour. * A second plane is now being constructed. * Solar Impluse has a goal of making an around-the-world trip in 2015, with 2-3 day flights over continents and 4-6 day legs over oceans. And just to prove it actually flies, here's video shot in the San Francisco skies before Solar Impulse began its USA journey. How much of terrestrial plant and animal life can humanity safely consume without seriously damaging the live-support systems of our planet? It has been challenging to answer that question because of the difficulty of measuring how much biomass is produced annually on land and how much of this yearly production humans co-opt. Huge regional variability exists in terrestrial productivity from year to year because of heat, cold, floods and droughts but what is striking from recent reviews of more than 30 years of satellite imagery is how little global variability there is annually. Each year, terrestrial plants fix about 53.6 petagrams of biomass – a gigantic quantity but what matters is not so much the size of annual biomass production but rather that it seems to vary by only about two percent per year. Recent estimates from satellite imagery indicate that humans now appropriate 38 percent of all terrestrial biomass generated annually. That would seem to leave 62 percent on the table for expanded human consumption but the vast majority of this biomass appears to be not harvestable because it includes root growth below ground and biomass production on lands in parks or wilderness areas that are either protected or inaccessible. It appears likely that the upper limit for how much of terrestrial biomass that humans can co-opt annually is only about ten percent more for a total of 48 percent. Current land use patterns and projections that the global human population may reach nine billion by 2050 suggest that this 48 percent of all available terrestrial biomass may be reached within the next few decades. 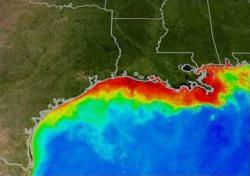 Gulf of Mexico Dead Zone: Nitrates washed off of cropland and delivered to the ocean by the Mississippi River feed big algae blooms, seen as red in this false-color satellite image. Bacterial decomposition of the dying algae consumes all oxygen in the water, producing a large area uninhabitable by fish and other sea creatures.Courtesy NOAANitrogen is an essential nutrient for plants. 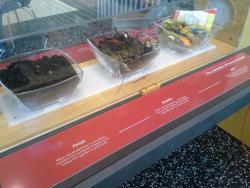 So how can nitrogen limit plant growth, given that nitrogen comprises 79 percent of the atmosphere? But atmospheric nitrogen is composed of molecules consisting of two atoms of nitrogen and this form of nitrogen cannot be used by plants. Farmers have for centuries spread animal manure on fields or plowed under leguminous crops (such as alfalfa which has microbial communities living on its roots that fix nitrogen) to add useful, reactive forms of nitrogen to soils. German ingenuity in the early 20th century invented an industrial process that made it possible for the first time to manufacture plant-usable forms of nitrogen, which made possible the artificial fertilizing of crops. Manmade production of ammonia and nitrate fertilizers has exploded in recent decades and now vastly exceeds the amount of atmospheric nitrogen converted into reactive nitrogen by microbial organisms around the world. At the same time, the burning of ever-increasing quantities of coal, oil and natural gas converts some atmospheric nitrogen into oxides of nitrogen (NOx). NOx emissions can both increase crop growth and diminish it because NOx gases help catalyze the formation of ground-level ozone and this gas is toxic to plant life. The huge increases of human-produced forms of nitrogen that are applied to croplands and that are released into the atmosphere and eventually settle out have many unintended consequences. In particular, excess nitrogen washes off of agricultural and urban landscapes and is accelerating the destructive growth of algae in lakes, rivers and coastal estuaries around the world. The connections between manmade carbon dioxide emissions and climate change are quite worrying and receive much scientific and media attention. Nitrogen pollution receives much less notice but is a dramatic example of how human activities now dominate many of the chemical, physical and biological processes that make this plant so amenable to human life.